Having a small bathroom is a common conundrum as real estate prices are steadily on the rise and many of us wish to prioritise location in our house searches. Still, it is often the case that even the smallest spaces actually harbour a lot of unused potential. It is easy to become discouraged when there are significant space constraints involved, but this challenge could actually spur some exhilarating creativity! With the right strategies in mind and a positive attitude, we are certain that a few changes will make a world of difference in your small bathroom. Start by considering colour tones, functionality, and how to create the illusion of space. These three factors alone will bring amazing transformative effects to the bathroom. Today we have a guide to outline some ways to apply them to your small bathroom. Although bathtubs can be nice, they are not exactly the most practical element of the bathroom. They take up a lot of space, and for most people, the majority of bathing takes place standing up in the shower. Another way to maximise vertical space is to choose a shower over a tub. This will free up some extra floor space and certainly make the bathroom look bigger. Imagine if a tub were to replace the shower in this bathroom. It would dramatically decrease the amount of available floor space in the bathroom, and therefore make it look and feel cramped. Something else to keep in mind when choosing a shower is the kind of shower door that would work best in a small bathroom. We recommend going with a clear glass door because it will also allow the perceived dimensions of the bathroom to extend into the shower. Any bathroom must have proper storage to be fully functional. All the toiletries, lotions, hair products, cleaning supplies, and linens really add up especially if you’re sharing the bathroom with others as many of us are. 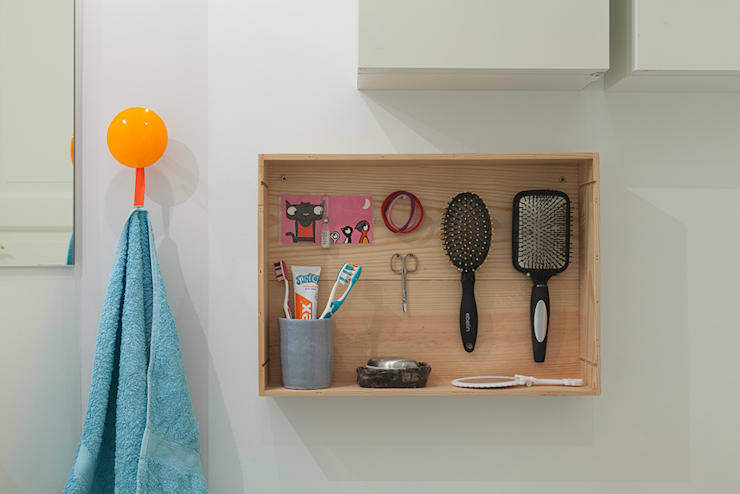 Finding a proper storage solution that is fit for a small bathroom can be an added challenge. Yet we are confident that lots of options exist no matter the size of your bathroom. Make sure you’re taking full advantage of the medicine cabinet. It is specially formulated to house small items, so if you have one it can take a lot of burden off of organising all those tricky little items that exist in the bathroom. If you do not have a medicine cabinet, it’s time to get creative. You could easily take a shallow rectangular wooden box with nails for holding small items and adhere it to the wall like we can see in this bathroom. Next, you may want to install some floating shelves for larger items. Floating shelves take up less excess space compared to other styles. On the topic of colours, you might be surprised at what a difference a new colour scheme in the bathroom can do for making it feel larger. Steer clear of bold tones, striking patterns, and black. These colours can play up the space constraints in a small bathroom and make it feel cramped and claustrophobic. Neutrals will not only help make the bathroom look larger by interacting with the light in the bathroom, but they will also help make it feel more tranquil. White in particular will help make the bathroom seem as large as possible. 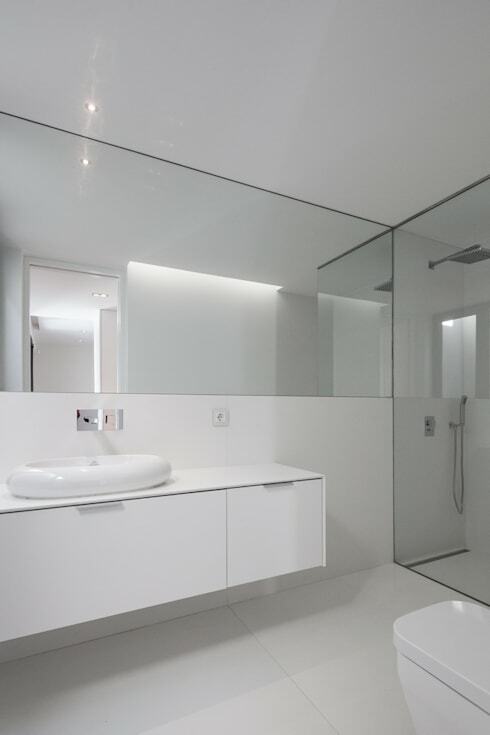 As we can see in this bathroom by Neostudio Architekci, white interiors also help to enhance natural light in the space. Natural light, in turn, can help the room look more expansive. There is only a small window in this predominantly white bathroom, yet the white interior helps to reflect what light there is. On the topic of using techniques to make the room look larger, we suggest you add some mirrors. Mirrors have been used to create the illusion of space in shops and homes for hundreds of years. This is because they have the propensity to multiply the perceived space in a given room. Additionally, they also enhance the effects of natural light. Try strategically placing mirrors so that they face each other, or hang mirrors in the path of natural light. To get the maximum effect, the bigger the mirrors the better, especially in a small bathroom. You can also arrange mirrors of varying sizes to create a more interesting and dynamic look. This bathroom doesn’t look nearly as small when dressed in a white colour scheme and outfitted with a large mirror. 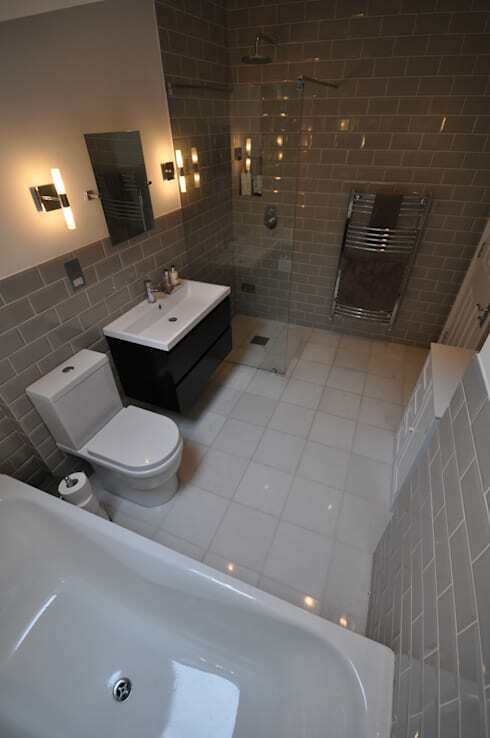 Functionality is of utmost importance in a small bathroom, because there isn’t much space for anything else! We’ve already covered how to tackle most elements of storage in your bathroom, but there is one additional area we’d like to consider. The shower itself can become quite cluttered with different soaps, shampoos, and other products. We recommend adding a shower rack or two to control the mayhem. If you live with your partner or with a roommate, each of you could have your own shower rack. 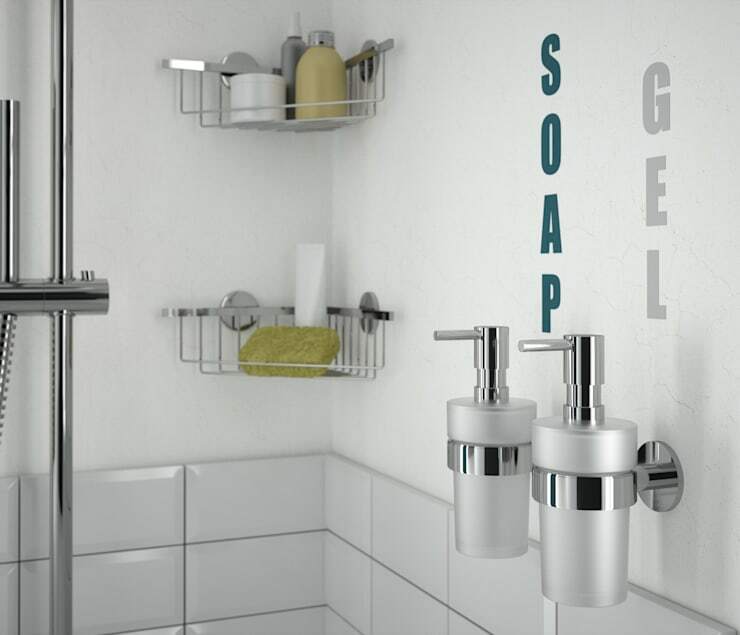 We also love the idea of including a holder for soap or shampoo dispensers like the ones pictured here. Another thing in the bathroom that can take up a lot of space are towels and other linens. For this, try placing towel racks up high so that you’re taking full advantage of the vertical space in your bathroom. Finally, while on the subject of the shower, there is one more important thing to take into account. The effects of using a clear glass door and choosing a shower over a tub will be enhanced if you also continue the floor tiles into the shower. 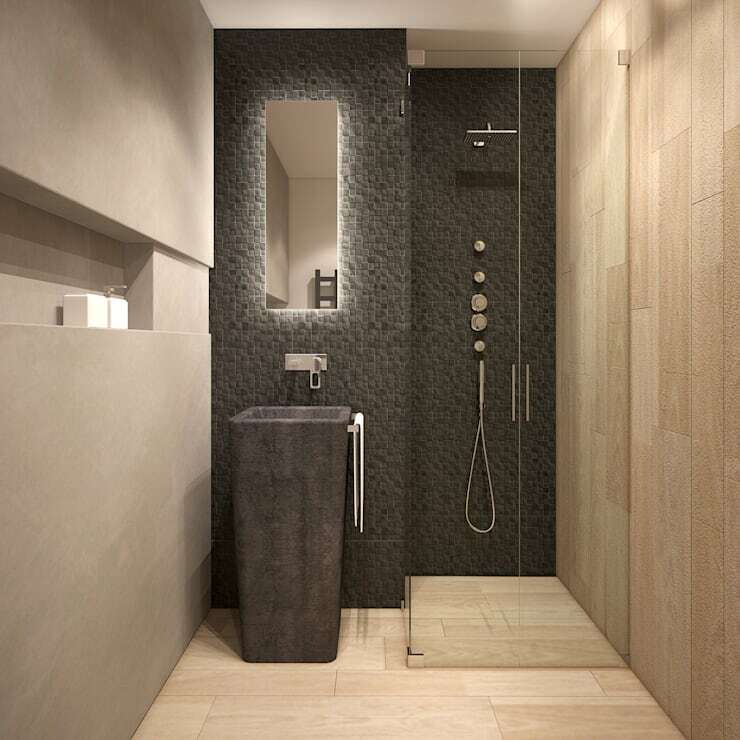 Not only will the barrier between the shower and the rest of the bathroom be made invisible with the use of a clear door, but the floor space will be virtually unobstructed. Without losing any of its functionality, the shower will be barely noticeable with the help of a glass shower door and floor tiles that match the rest of the bathroom. 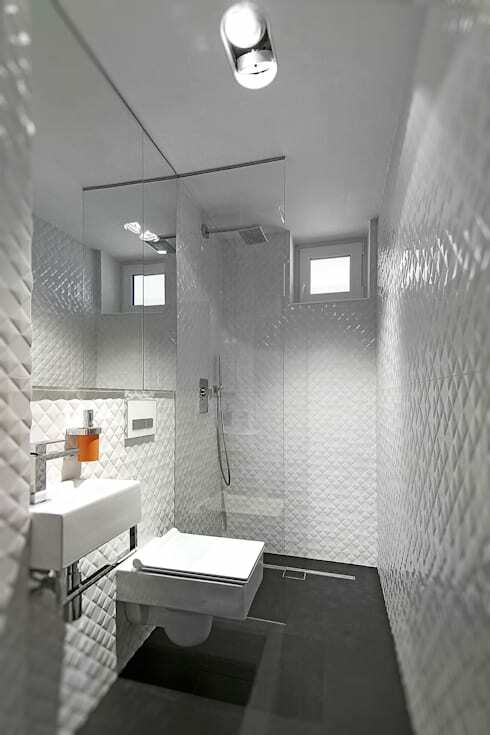 In this bathroom, the walls are the same throughout the entire bathroom, the shower door is made of glass, and the tiles extend into the shower. The result is a mini addition to the bathroom at a fraction of the price. For more tips on small bathroom ideas check out these simple solutions to making a small bathroom look larger. Happy decorating!